Dr. Alice Kuo is a Professor of Internal Medicine and Pediatrics at the David Geffen School of Medicine at UCLA, and of Health Policy and Management in the Fielding UCLA School of Public Health. She is also Chief of Medicine-Pediatrics at UCLA. Her research interests include access to and delivery of developmental services, cognitive and language development in young minority children, and services for children and adults with autism and other neurodevelopmental disorders. Since 2014, she has been the Director of the Maternal and Child Health Bureau (MCHB)-funded Health Care Transitions Research Network (HCT-RN) for Autism Spectrum Disorder. In addition to her research, Dr. Kuo has been involved in educational programs at several levels, from undergraduate students to post-graduate fellows. Since 2006, she has been the Director of the MCHB-funded Pathways for Students into Health Professions for disadvantaged undergraduate students interested in public health and health professional careers. At the post-graduate level, Dr. Kuo is the Director of the UCLA Combined Internal Medicine and Pediatrics Residency Program, which she founded in 2003. In 2016, she became the Director of the University of California Leadership Education in Neurodevelopmental Disabilities (UC-LEND) program. At the national level, she has been the chair of the Health Care Transition Committee for the Medicine-Pediatrics Program Directors Association since 2012. Dr. Kuo has held several leadership positions at the national, state, and local levels in the American Academy of Pediatrics, and has chaired workgroups in the American College of Physicians and the Society for General Internal Medicine. Clinically, Dr. Kuo sees primary care patients at the Medicine-Pediatrics Comprehensive Care Center in Santa Monica and at the Medicine-Pediatrics practice in Redondo Beach. 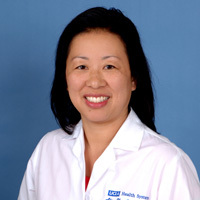 Dr. Kuo received a BA in Biology from Harvard University, her MD from UCLA, her PhD in Educational Psychology with a focus on Early Childhood and Special Education from the Graduate School of Education and Information Studies at UCLA, and her MBA in Healthcare Administration from the University of Massachusetts Isenberg School of Management.